Salmon farming—the fastest growing food production system in the world—is going through hard times in Chile, the world’s second-largest salmon producer after Norway. Last year, Chile exported $4.5 billion of farmed salmon, but now a deadly algal bloom is killing millions of farmed fish. El Niño, which warms the equatorial Pacific, is certainly one of the factors to blame in the massive fish die-off. The warm water encourages the growth of toxic algae, which cause the so-called red tide—an algal bloom that turns the seawater red and makes seafood toxic. Although the red tide is a common, naturally recurring phenomenon in southern Chile, the extent of the current outbreak is unprecedented, so much so that it has been defined “one of the country’s worst recent environmental crises.” The toxic algal bloom threatens the local marine life as well as the livelihood of the fishermen who depend on it. But, El Niño is only one of the factors responsible for the red tide. Liesbeth van der Meer, who heads the Oceana environmental group in Chile, believes that runoff from neighboring livestock creates concentrations of nitrogen that, when mixed with the above-normal temperatures, lead to the ideal scenario for the algae to grow. Another factor appears to be the salmon farming itself, which encourages toxic algal blooms. How? Nutrients dumped into floating salmon cages fall to the seabed forming underwater banks that act as a toxic algae reservoir. Marine biologist Hector Kol told The Guardian: “The problem we now have is a red tide of biblical proportions. Chiloé has changed, the sea is toxic. Right now we have a red tide with symptoms of diarrhoea, amnesia and paralysis from near the Straits of Magellan to Valdivia”—in other words, the phenomenon involves a stretch of more than 1,200 miles of coastline. In addition, residents accuse salmon producers of exacerbating the algal bloom by dumping contaminated fish near the coast—millions of salmon died earlier this year due to another algal bloom that asphyxiated fish by decreasing oxygen in the water. Now, according to the Chilean government, scientists will determine whether or not dumping tons of rotting salmon into the Pacific contributed to the massive red tide. In the mean time, fishermen blockaded the principal access point to the island of Chiloé for two weeks, thus largely isolating its population and stranding some tourists. Felipe Manterola, general manager of SalmonChile, warned that if the blockade continued, the remaining healthy salmon could resort to “competition and cannibalism”. The Chilean setbacks have pushed up global farmed salmon prices. Chile’s exports will drop by 35% to 45% this year, resulting a monthly salmon shortage of between 15,000 metric tons and 20,000t a month to global markets. Only a year ago, Chile salmon farmers used record levels of antibiotics to control the spread of an infectious microbe that was causing a lethal disease in their fish. As heavy use of antibiotics in animals can exacerbate the spread of drug-resistant superbugs, thus endangering human health, some U.S. grocery chains started to gradually eliminate farmed salmon from their shelves. It seems that this post touches on a more important issue than salmon farming practices –the obvious lack of education regarding sustainability issues among the population today are outrageous, and unsettling. As stated before, salmon farming practices are highly affected by these algal blooms and other obvious malpractices, however, this area is not the only facing distress. Although El nino is not something man can control, overfishing, over-medicating and proper waste disposal absolutely are. I was absolutely disturbed upon watching a documentary called “Racing Extinction,” by the Oceanic Preservation Society (and if you haven’t watched it, I highly recommend it.) The documentary touched on many things, but shark finning was one of them. Shark finning is a major problem in the east, where sharks are now at risk of endangerment due to overpredation, for what? Soup. The sharks are caught, their fins sliced off, and are thrown back into the ocean where they sink to the bottom suffering…unable to swim or defend themselves. There are now approximately 2300 endangered or threatened marine species according the National Oceanic and Atmospheric Association including salmon, dolphins, whales, and sharks. To me, this screams that this is a human problem, not an environmental problem. Animals have been hardy and have survived millennia by adaptation. If we continue at the current rate, generations after us will not have the joy of knowing these species, especially if we continue to kill them off. The problem starts with us, as consumers. We can blame the men trying to make a living all we’d like, but I truly believe the best way to fix the problem is anti-consumerism. Shark fin soup is a “delicacy” in many eastern countries, and salmon is a staple in the diet of Americans, but it is only so because people purchase it. If the demand plummets, the need for supply does as well. There is a whole lot of sadness, and a whole lot of irony, with the shark finning disgrace. Those eating all of that shark fin soup, are poisoning themselves with the neurotoxic BMAA accumulated to a high degree in shark fin. In a few years time, it could be very interesting to note the correlations that could result with neurologic disease progression in avid soup imbibers. Cyanobacteria toxins may soon to be understood as another of the pathogenic influences for ALS, PD, and other neurologic ailments, as seen in Guam historically with ALS/MND. Wow. Interesting read. There appear to be multiple variables and layers to this unfortunate phenomenon; the summary mentioned El Nino, increased red algae bloom, toxic runoff, and the dumping of rotting fish as examples. The situation seems like a perfect storm, and I agree there has to be a multifaceted plan in place to prevent or mitigate this almost unnatural occurrence. I stress unnatural, because even though several species, with or without human interference, go extinct daily, the rate of incidence at which these animals are dying is alarming, and it’s readily apparent we aren’t doing enough to help. I feel very sympathetic towards the men and women who lost their livelihoods, and I hope things get better for them and the nation of Chile. As for Americans, the unavailability of salmon, which provides proteins and omega-3 fatty acids beneficial to immune health and general health (by “modulating inflammation, hyperlipidemia, platelet aggregation, and hypertension”), will likely increase the incidence of (or continue the trend of) autoimmune, inflammatory, and metabolic disorders in the population (Ergas et al., 2002 & Molfino et al., 2014 & Zivkovic et al., 2014). Ergas D, Eilat E, Mendlovic S, Sthoeger ZM. n-3 fatty acids and the immune system in autoimmunity. Isr Med Assoc J. 2002;4(1):34-8. Molfino A, Gioia G, Rossi fanelli F, Muscaritoli M. The role for dietary omega-3 fatty acids supplementation in older adults. Nutrients. 2014;6(10):4058-73. I totally agree that salmon farming in the open ocean is unsustainable for many reasons. In Canada, open ocean farming was blamed on the wild salmon population collapse. There is a movement in a few areas to move from open net salmon farms into inland and away from the ocean. This farm in West Virginia is a sustainable alternative to salmon open ocean farming. The landlocked farming of fish prevent these toxic blooms. The farm keepers have the ability to control the environment (the intake and waste products) while creating an ecosystem friendlier product. In Chile, if they move towards a more ecosystem-friendly farming of fish those families losing their jobs will have more stable ones in the same field. @JonSnow, I took a look at the article that you mentioned (i.e. Landlocked fish farm in West Virginia) to understand more about this proposed sustainable alternative. In theory, it does sound like a great alternative to mass-fish farming in ocean enclosures (or in estuaries), as seen in Chile; however, the use of a sprawling compounds of buildings with fish tanks already in place), in my opinion, immediately presents red flags. First, what standards are set, who sets them, and how often are they checked (i.e. what is the protocol for quality assurance)? Second, this alternative, posed by Blue Ridge Aquaculture, wants to employ technology created by MariCal Inc. of Portland, Maine so that fish, typically harvested from salty coastal environments, will grow in tanks fed by freshwater sources. Cool idea, seriously. BUT as a scientist, I am realizing that they (i.e. MariCal Inc.) did this through molecular-based bio-engineering – via control of proteins called calcium receptors within the fish. Thankfully, I understand the workings behind this idea because of my scientific background, but most people have not spent the majority of their life studying science at such a deep level and this would make me believe that these companies will be leaning on consumer ignorance in order to sell their products. Basically, instead of using natural environments, and keeping sustainability in mind, we want to create bio-engineered fish for mass-consumption? 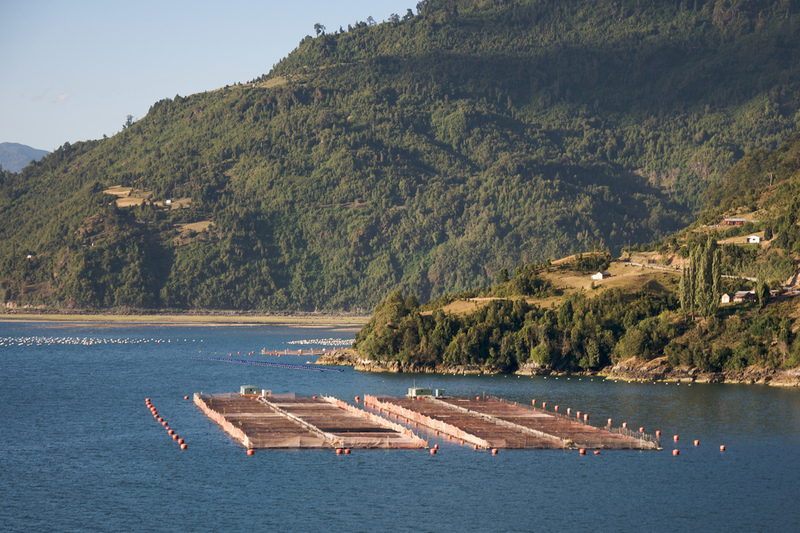 Salmon farming is one of the main Chilean economic activities, however, recent algal blooms have threatened Chile’s present and future ecosystems, marine life, and how fisherman make their living. What can be done to predict, prevent, slow, or stop these harmful algal blooms? Scientists at the National Oceanographic and Atmospheric Administration are focusing on creating a system that can do these things — they are “experimenting with a sensor that can identify three types of dangerous microscopic algae by their genetic material and offer an early warning when they are detected in the water.” They are already “testing this in the Gulf of Mexico by using information collected from satellite images, water condition information from weather buoys, and visual observations from scientists to map blooms and predict their spread.” Hopefully, scientists are successful and can implement such technology in the world’s major aquaculture spots in order to both protect marine wildlife and save the future of economies worldwide who depend on it.